It’s never too early to start preparing for your child’s preschool plans. Studies have shown not only that a child’s brain development and capacity for learning begin at birth, but also that those who engage in preschool perform better over time than those who start school in kindergarten. Enrolling your child in preschool is important — and it’s even more important to choose the right school. Montessori programs are especially effective at preparing your preschool aged child for future success in school and in life. So, how do you know which preschool to choose? Which program will meet your child’s needs and prepare him well for his future? As you visit potential preschools for your child, keep an eye out for these ten traits, which have been demonstrated to help children excel. 1. Children are joyful, enthusiastic learners. When children are happy to be at school, they are likely to learn better. Effective preschools encourage children to engage in activities, games, and lessons that incorporate both play and education. Play time and study time happen both inside the classroom and outdoors. Here at Primary Montessori, our classrooms are roomy, sunny, and both indoors and outdoors to foster our students’ joy of learning. 2. Children exhibit care and concern for themselves and others. A good preschool helps children build self-esteem and learn effective social skills, such as resolving conflicts and challenges. Children develop courtesy, compassion and respect for others in a Montessori school, which prepares them early on for successful social interactions as they grow up. 3. The preschool’s environment is well maintained. Young children do well in settings that are calm, tidy, orderly and attractive. And Montessori classrooms foster opportunities for children to engage in caring for their environment by inspiring them to keep the classroom neat and clean. 4. Freedom of movement is an essential part of the learning process. The Montessori method builds on the fact that children learn through doing and movement by creating opportunities for them to move freely about the classroom and choose their own work. They are not expected to sit quietly for long periods. Instead, they are welcome to explore the entire class space. 5. Children choose their own work and exhibit self-motivation. In Montessori classrooms, children enjoy the variety of engaging in activities on a flexible schedule, rather than being regimented to studying the same subjects at the same time each day. This allows them to develop internal motivation, which will help them excel later in life. Learning can also be adapted to suit your individual child’s strengths. 6. Children work and play in mixed age groups. 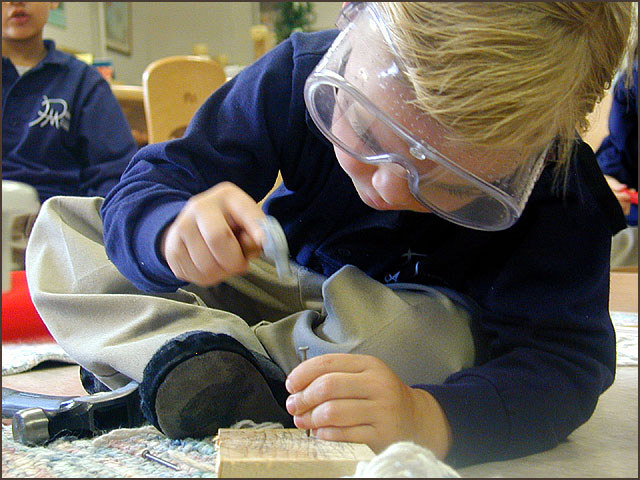 There are many benefits that come from a mixed age Montessori classroom. Children can practice relating to those who are older and younger than they are, which improves their social dexterity. Older children can share what they have learned with younger children. 7. Learning opportunities happen on an individual basis as well as in groups. As part of the Montessori approach, learning happens in many ways. Guides (teachers) are free to work with children individually and in small groups for more personalized learning experiences, rather than just offering generalized instruction to one large group all day long. 8. Learning takes place at the child’s own pace. Instead of forcing children to match the speed of their teacher’s instruction, the Montessori method provides children with extended times of play and learning, as well as the opportunity to work at their own speed. This means they can work faster as well as slower, depending on their own development and mastery of a given skill. 9. The curriculum includes both traditional education and life skills. In Montessori programs, children develop holistically, learning much more than the traditional ABCs. In addition to reading and math, your child should learn about nature, animals, plants and people. They should also engage in practical life skills like caring for and putting materials away, hand washing, putting on their own coat or shoes and more. 10. The preschool has a track record of experience and is properly certified. Here at Primary Montessori, we have thirty-four years of experience teaching the Montessori curriculum while serving the education needs of young children and their parents. We are approved by the Maryland State Board of Education and are a member of the American Montessori Society. Schedule a tour of Primary Montessori, and see how your child can benefit from an early education that builds his confidence and equips him for future success, both in and out of the classroom. Fill out our online form or call us today at 301-309-9532.